United Hoster Review 2019: Is United Hoster a Good Hosting? United Hoster is a full service hosting company based in Germany. The company owns and operates two data centers, and it has a robust uptime guarantee. United Hoster (usually decapitalized, but it doesn’t look so good in print) is a German host that was founded in 2003. This hosting provider has 35 employees, lots of positive reviews on independent websites, and it owns and operates two 100% green energy-powered ISO 27001 data centers located in Frankfurt and Cologne. Although their main website is in German, their checkout flow is also available in English. I’m pleased to see that United Hoster owns and operates two German data centers, one in Cologne and one in Frankfurt, which both run on 100% green energy and are ISO 27001 certified. These data centers also have redundant, environmentally-friendly UPS systems and a redundant fiber-optic network, and they benefit from 24/7 monitoring. United Hoster’s website states that they “have enough capacity to guarantee the highest quality and security of hosting,” and this claim is backed by an SLA that guarantees data center availability of 99.996% on average each month. The hosting plans use the popular Plesk control panel, and the servers run on 100% SSD storage for disk read/write speeds up to ten times faster than traditional HDD. In terms of security, all plans come with DDoS protection as standard, and your data is subject to Germany’s data protection laws. 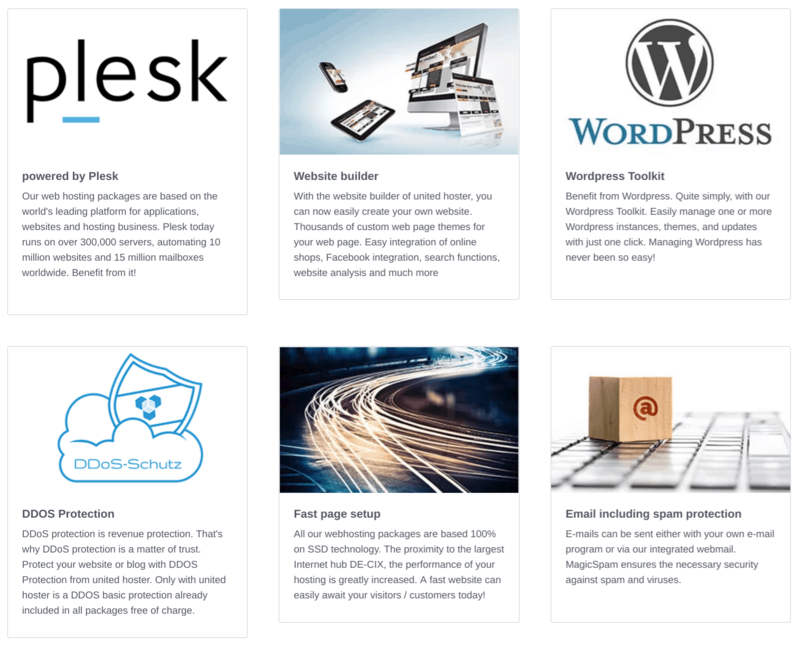 There are three simple, yet relatively feature-packed shared hosting plans that come with a website builder (great for beginners), a one-click installer (for only ten programs), and a WordPress toolkit to help you manage your WordPress websites. For experts, some of the value-added features include support for PHP version 7.0, FTP access, multiple MySQL databases, Cron jobs, and support for advanced coding languages Perl and Python. Since the plans are so feature-packed, and the company owns its own data center, and they boast a good uptime SLA, United Hoster’s prices are understandably higher than local and international competitors. You can purchase plans only on six-month terms, but there is no money-back guarantee or free trial to make you feel better about making the commitment. Although SSL certificates and domain registration are included, you will see that a “facility fee” is added to the final price. You can contact this company for customer service by telephone (extended business hours), email, and support ticket. A little disappointingly, the advertised response time is 12 hours if you contact them during business hours. When I sent them an email, I received a polite and helpful response within one day. Whilst I’m left a little underwhelmed by the customer service, I’m pleased to see a pretty substantial knowledge base that will help you to help yourself. United Hoster has many industry partners and is highly certified. The company has a solid uptime SLA and a robust infrastructure. Although not the cheapest on the market, this is definitely one to consider for customers who want a solid host. Wondering how United Hoster stacks up against other Web Hosting companies? Enter any other Web Hosting company and we will give you a side-by-side comparison.